Just two hours from Miami, Houston, Atlanta and Dallas, all which have direct flights, lays an island many travelers and investors in the past have overlooked: Roatan, Honduras. Previously a battleground for Spanish conquistadors and British pirates, Roatan has become a destination for travelers worldwide who seek relaxation, tropical island life, great diving, a rustic Caribbean feel and profitable investments. 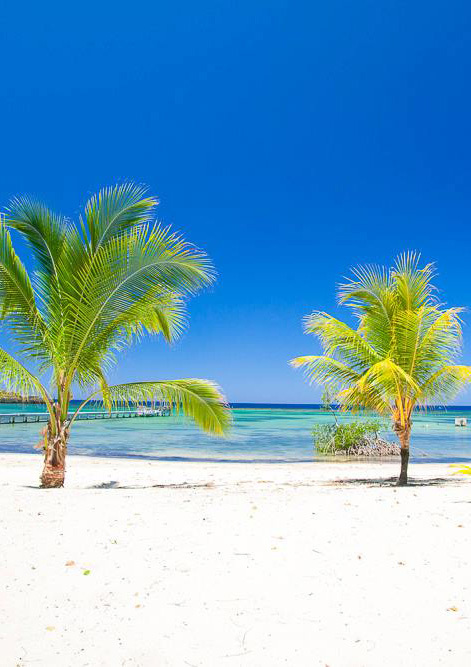 Roatan is located off the coast of Central America in the Caribbean Sea. Costa Rica, Panama, Belize and Cayman Islands are short and easy trips from Roatan. The democratic government is stable and investor friendly. The official currency in Honduras is the Lempira (L), which offers an approximate exchange rate of 24:1 for the U.S. dollar. The cost of living in Roatan is much less than most of the Caribbean. Visitors can get to Roatan (RTB) with direct flights (Roatan has it's own international airport) from several airports: Miami, Houston, Dallas, Atlanta and Toronto. Travelers should check with Grupo Taca, Continental, American Air, and Delta for direct flights to Roatan. Other than flying to Roatan, the only other public transportation option is the ferry service offered from La Ceiba. The ferries owned and operated by Safe Way Maritime Transportation Company, take ninety minutes and cost $25 each way. Ferries leave La Ceiba twice daily-check with the ferry terminal for the current days schedule and arrive early to purchase tickets. Roatan offers the best of two worlds: modern facilities, infrastructure, an international airport, public and private hospitals and a growing number of marinas yet remains charming with miles of remote sandy beaches and small fishing villages in front of one of the greatest reefs in the world. While this may sound like many other Caribbean destinations, Roatan is the perfect island for people who are looking for a place to get away from it all. The main town on Roatan is Coxen Hole where you can find banks, medical facilities, travel agents, grocery stores, a post office and other necessities including a public gym. French Harbor is another main town on Roatan where you can find many of the same services. Both of these towns are suitable for gatherings with families and friends and both are a great place to meet and interact with friendly locals. Towards the west of the Island is the West End of Roatan where you can find the most popular white sand beaches and an abundance of local dive shops. Just before the West End of Roatan is Sandy Bay, where one of the nicer developments on the island is located, Lawson Rock. Heading east from Coxen Hole and the West End is Brick Bay, home to a well protected harbor. Roatan was released from British control around 1860, but has yet to completely adapt to mainland ways. Though the official language of Honduras is Spanish, the most common language spoken on Roatan is Caribbean English. The official currency is the Lempira, but U.S. dollars are used just as frequently for all transactions. Credit/Debit ATM cards are also accepted at bigger businesses. Roatan has electricity, high-speed Internet, telephones, running hot water, and most modern infrastructure. Roads on Roatan are easy to navigate; one main road runs lengthwise down the middle of the island. Most roads are paved. Unpaved Roatan roads are easy enough; be wary when conditions are wet. People who plan on driving on Roatan should be aware that driving while using a cell phone, driving while smoking, driving without a spare tire and the tools to replace a bad tire, and other uncommon traffic laws are crimes that will result in fines. Roatan is home to crime, just as any city is. Most crimes committed on the island are petty thefts and robberies that occur when no one is around. However, visitors and all people should use caution when traveling with valuables and never leave them unattended. The bars of West End have become famous over the recent years; Friday and Saturday nights host live music and Caribbean discos are where everyone can be seen at the end of week. Sunday gatherings such as Beachers, Sundowners, Hole in the Wall and Bananarama are also very popular places to enjoy a great meal and a few cool drinks and to enjoy the wonders of the Island on a lazy Sunday. During the week the restaurants and bars all over Roatan continually serve up something special for everyone. Staying in Roatan ranges from very inexpensive to very expensive based on individual tastes—Roatan has accommodations to suite most everybody’s needs. Arrangements for accommodations can be made before arriving or found once on the island. If you are traveling during the peak season (December to August) be sure to book something in advance. For more information, be sure to check this website out often for up-to-date reports, news stories, travel, and investment information about Roatan. If you have any further questions on Roatan please do not hesitate to contact us. We have lived here for many years and Roatan is our home. We are happy to share with you the knowledge and the wonders of life on Roatan. We are happy to also give you a complementary Roatan Relocation and Investment Guide.